Beyond providing data for all 32 NFL teams, PFF also supports network broadcasters with game-preview packets that are used to enhance the in-game experience for fans and viewers. 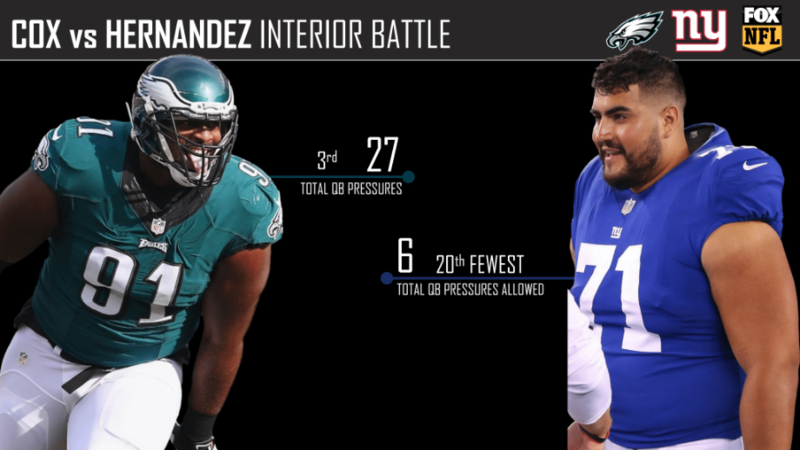 This Eagles-Giants preview features the same information our broadcast partners use for team research and in-game production. 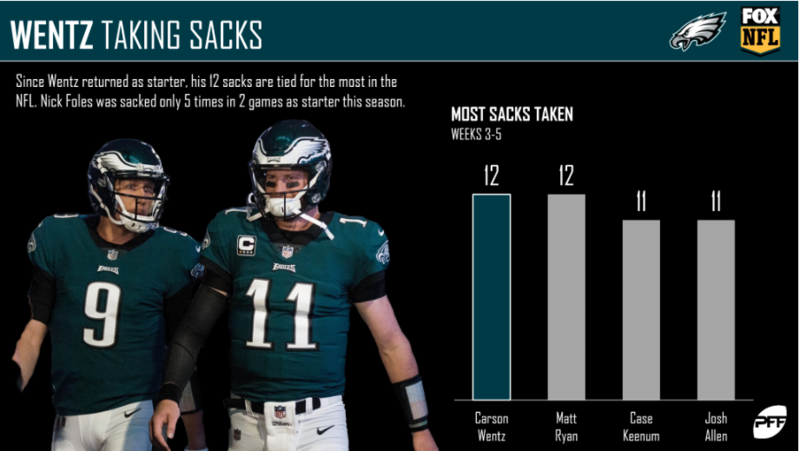 Since Carson Wentz returned as the starter in Week 3, his 12 sacks taken are tied for the most in the league. While Wentz may still be getting up to speed with an average time-to-throw of 2.56 seconds, his offensive line hasn’t done him any favors, ranking 21st in pass-blocking efficiency over the past three weeks. Upon Wentz’s return to the lineup, not all aspects of the offense have been clicking as the Eagles may have hoped. Nine of Wentz’s passes have been dropped, with eight of those coming under 10 yards down the field. The Eagles pass-catching woes are made evident by the team’s 61.8 overall receiving grade. 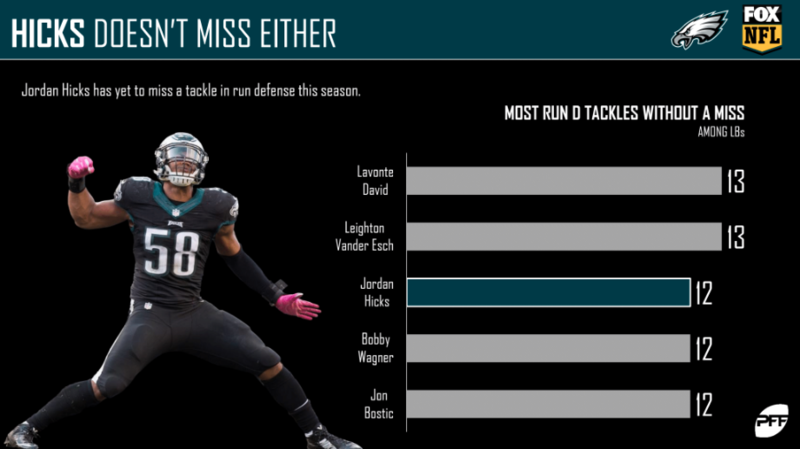 Jordan Hicks has made a big impact on the Eagles defense, as he’s yet to miss a tackle in run defense. Hicks will be tested this week going up against rookie running back Saquon Barkley. 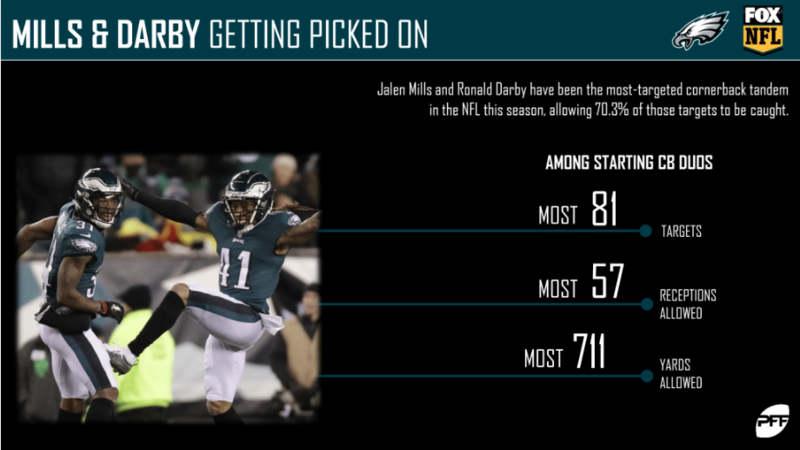 Starting cornerbacks Jalen Mills and Ronald Darby have been the most-targeted cornerback tandem in the league this year and have allowed 70.3% of those targets to be caught. It’s been a rough start for the two, as neither has an overall coverage grade above 60.0. 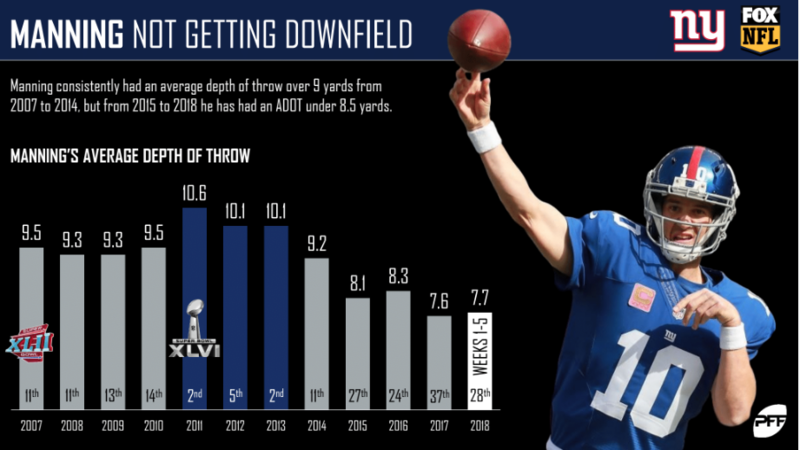 Eli Manning is on track to record an average depth of throw of under 8.0 yards for the second season in a row. Both of his super bowl wins came in seasons where his aDOT was over 9.0, an aDOT he hasn’t achieved since 2014. 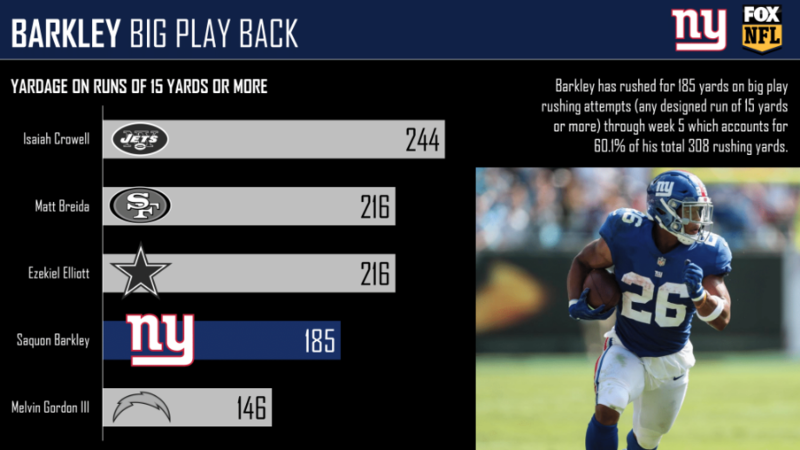 Saquon Barkley has gained 185 of his 308 rushing yards (60.1%) this season on carries gaining 15 yards or more, the fourth-most yards gained on big play runs. B.W. 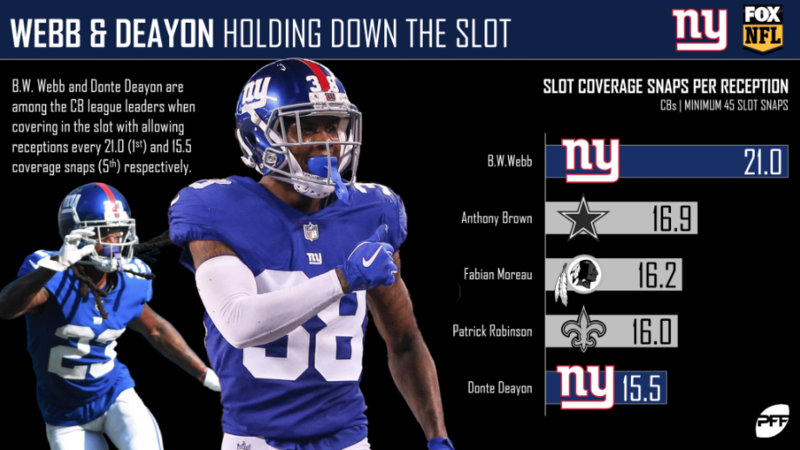 Webb and Donte Deayon have been two of the most efficient slot cornerbacks this season, as they rank first and fifth, respectively, in slot coverage snaps per reception allowed. They’ll see a lot of Nelson Agholor this week, who averages one reception every 7.5 routes run from the slot. 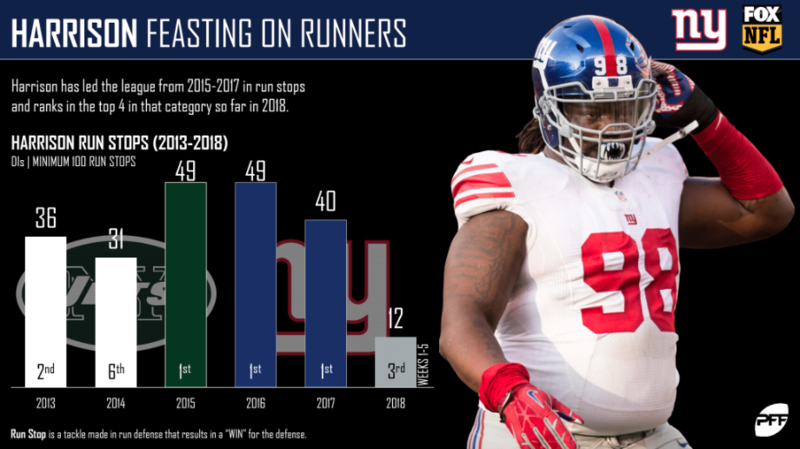 Damon Harrison has been one of the top run-stopping interior defenders throughout his career and led the league in run stops from 2015 to 2017. He is actually having a down year by his standards, with just 12 run stops thus far, only third most among interior defenders. 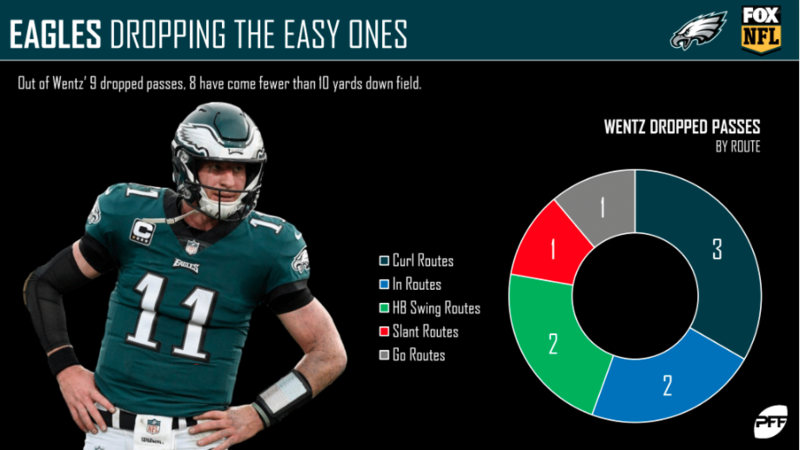 PFF Greenline has projections for the spread, moneyline and over/under of the Eagles’ matchup with the Giants. Get its picks here.